After a mysterious prisoner with only a few weeks left on his sentence breaks out of prison in Central City, the Elric brothers attempt to track him down. 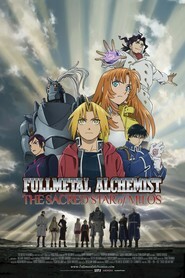 The search leads them to Table City in the southwestern country of Creta, where Alphonse rescues a young alchemist named Julia from the very man they are trying to capture. In the thick of the fight, they literally tumble into Julia's home turf, the slums of Milos Valley, and are embroiled in the grassroots rebellion of her people. 5 Yu-Gi-Oh! Movies Like Yu-Gi-Oh!